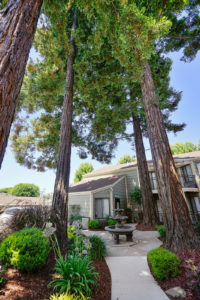 Berry Tree is a beautiful set of apartment buildings located in a secluded, quiet area nestled within a small forest of redwood trees. With a variety of apartment sizes, including one and two bedrooms, you’ll be able to find one that suits your taste and budget. Berry Tree Apartments in Hayward, CA is located at 575 Berry Avenue. The complex is just a few minutes away from family recreation and parks such as Alameda Creek Regional Trail, Quarry Lakes Recreational Area, Don Castro Recreational Area and Sulfur Creek Nature Center. Also, within a few minutes’ drive from Berry Tree apartments, you’ll find the famous Chabot Community College and Cal State Hayward College which include notable alumni such as Tom Hanks! Residents can easily find local gyms, grocery stores, and major highways leading out of the East Bay area. You will enjoy the clean, serene and natural environment of Berry Tree along with the scenic landscape that receives constant attention from on-site management. Berry Tree Apartments in Hayward, CA is a highly-praised apartment complex, largely due to its well-maintained environment, attractive greenery, secure gated access and spacious apartments. At Marcotte Properties, we have a long history of maintaining homes and we use our five decades of experience and expertise to create a unique environment you’ll love to come home to. New tenants can apply for any of the Berry Tree apartment openings for one and two bedroom living spaces decked out with attractive interior decor, functional kitchens and household appliances. Each unit enjoys its own specially assigned parking spaces. You can also enjoy a refreshing dip in the pool every evening and use the cable/high-speed internet service ready to stay connected while enjoying the best of family entertainment. If you want to live in one of the best apartments available in Hayward, CA, Berry Tree Apartments is an excellent choice. Call Marcotte Properties today at (800) 538-1724 for more information.